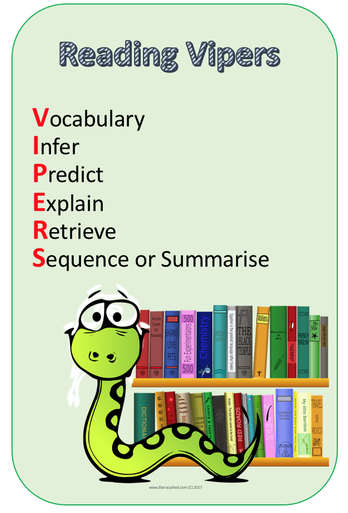 Reading VIPERS is our way of supporting children with their reading comprehension skills. All children will be working on VIPERS during class reading, whether it is reading as a class, in a small group, or one-to-one with an adult. It would be fantastic if parents could also be referring to VIPERS when they listen to their child read at home. This poster is displayed in all classrooms. Up to the end of Year 2, the 'S' stands for 'Sequence'. Once children move into Year 3, the 'S' stands for 'Summarise', which is a more demanding skill. If we ensure that children are competent in all of these reading skills, we are covering all of the National Curriculum requirements and enabling them to be strong, confident readers. This acronym is just a great way of helping children and parents to remember what these vital skills are. VIPERS can be used on any text that a child is reading, as well as on pictures, picture books and films! When any adult is listening to a child read, all they have to do is think of questions about the book/picture/film that cover all of the VIPERS, and there are great examples below of how you can create your own questions using the following question openers. What does the word ..... mean in this sentence? What does this word or phrase tell you about .....? What do the words ..... and ..... suggest about the character, setting and mood? Which word tells you that .....? Why was .....? feeling .....? What do you think the author intended when they said .....? How can you tell that .....? What do you think will happen next? What makes you think this? What is happening? What do you think happened before? Do you think ..... will happen? Yes, no or maybe? Explain your answer using evidence from the text. What does this paragraph suggest will happen next? What makes you think this? Is there anything you would change about this story? Do you like this text? What do you like about it? The mood of the character changes throughout the text. Find and copy the phrases which show this. How does the author engage the reader here? Why is the text arranged in this way? How would you describe this story/text? What genre is it? How do you know? What was the first thing that happened in the story? Can you summarise in a sentence the opening/middle/end of the story? In what order do these chapter headings come in the story?